One of the best things about living in the North Carolina is all of the wonderful fresh fruits and vegetables that are available from spring to late fall. 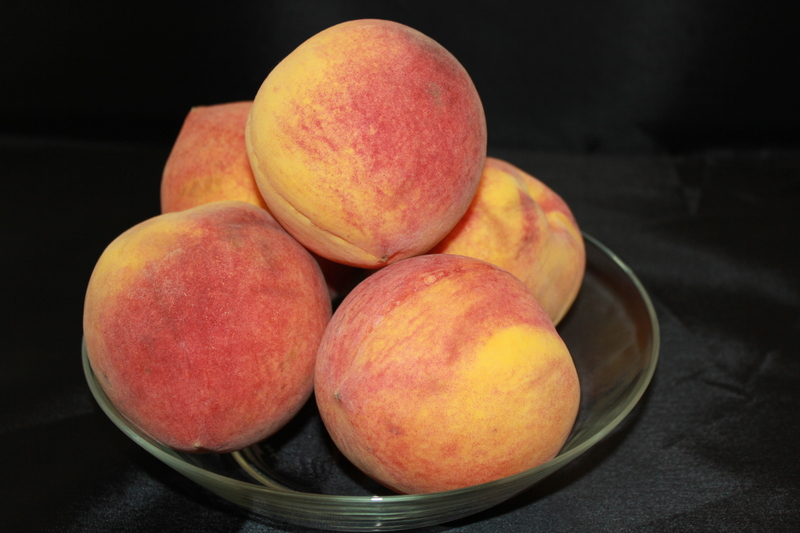 One of my favorites is peaches – I get so excited when the locally grown ones start arriving at the Farmer’s Market. I love to have fresh peaches on cereal, mixed in vanilla yogurt or just by themselves as a late afternoon snack. And it’s hard to beat a sweet peach cobbler with a scoop of vanilla ice cream – yum! 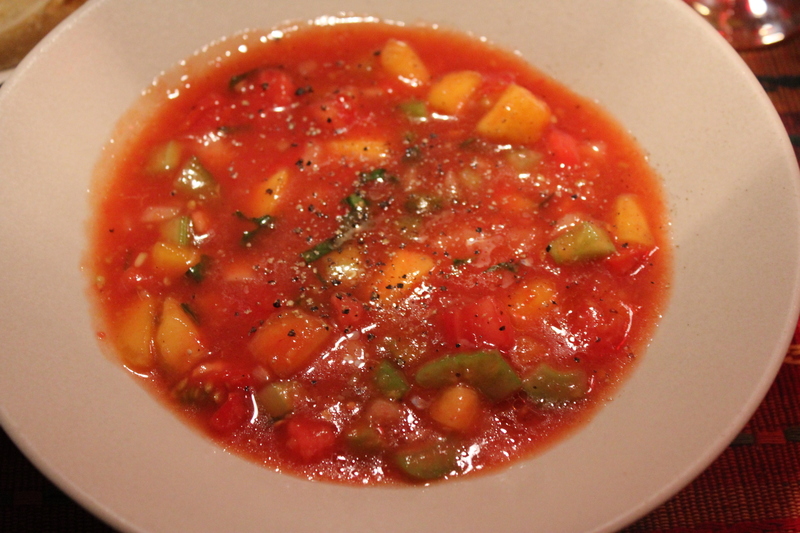 August is national peach month so to celebrate I decided to make a cool and refreshing peach and tomato gazpacho. 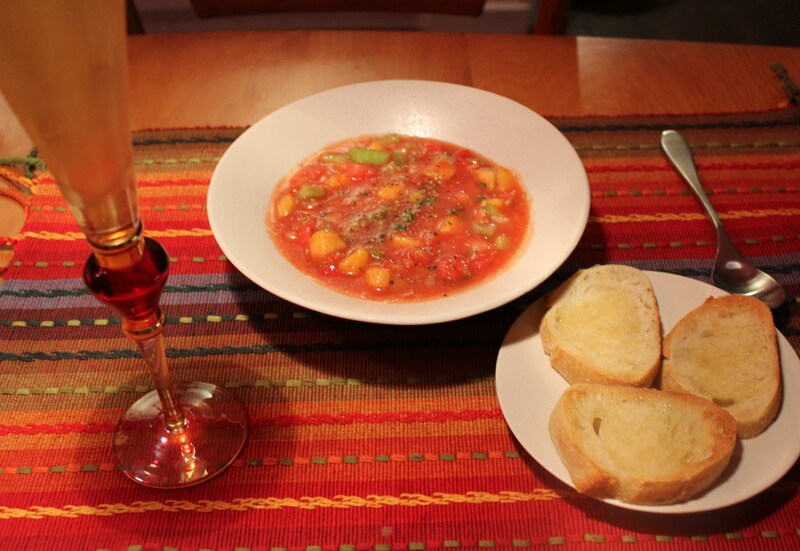 Chilled soups are so good in the summer and gazpacho is one of my favorites. You may remember my post last year for a traditional gazpacho, full of fresh tomatoes, corn, celery, cucumbers, onion, etc. This year I decided to add peaches to the tomato-based soup, and this is what I came up with. 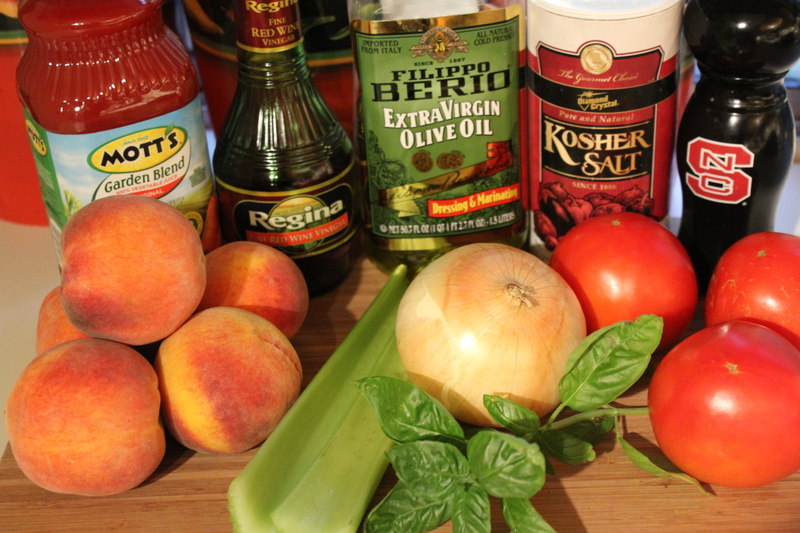 The peaches and tomatoes blend so well with each other and the celery and sweet onion give it an added crunch. I’m not sure which version I like better! 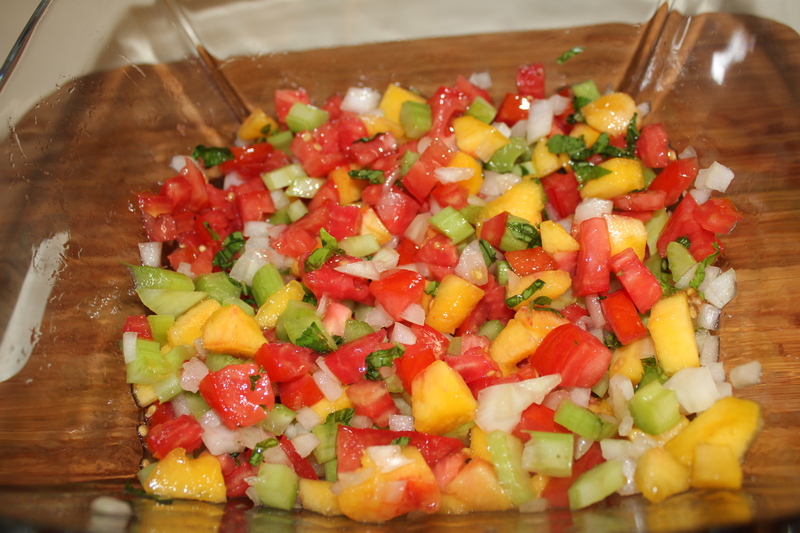 Place the diced peaches, diced tomatoes, celery, onion and basil in a large bowl and mix well. 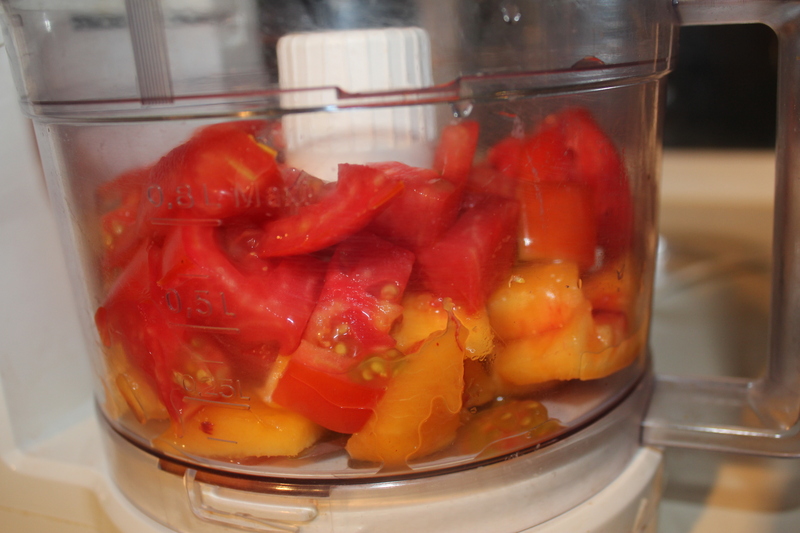 Put the roughly chopped peaches and tomatoes in a food processor and blend until smooth. 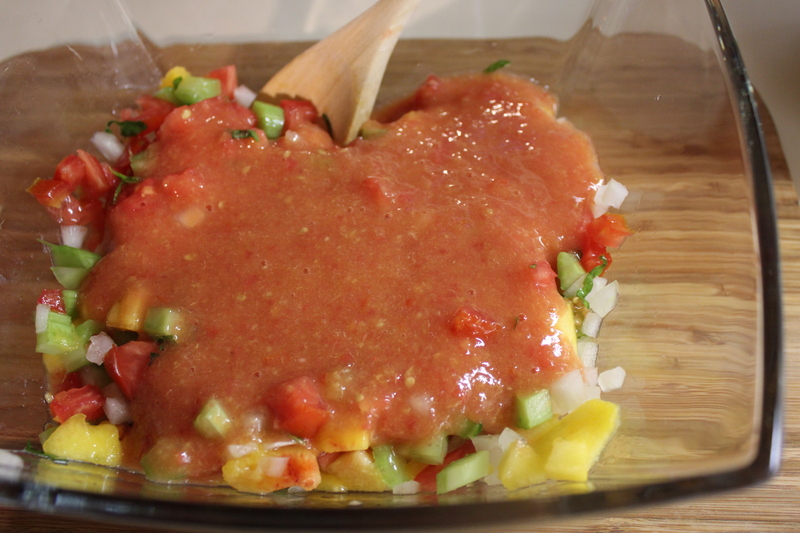 Add this mixture to the veggies and peaches. 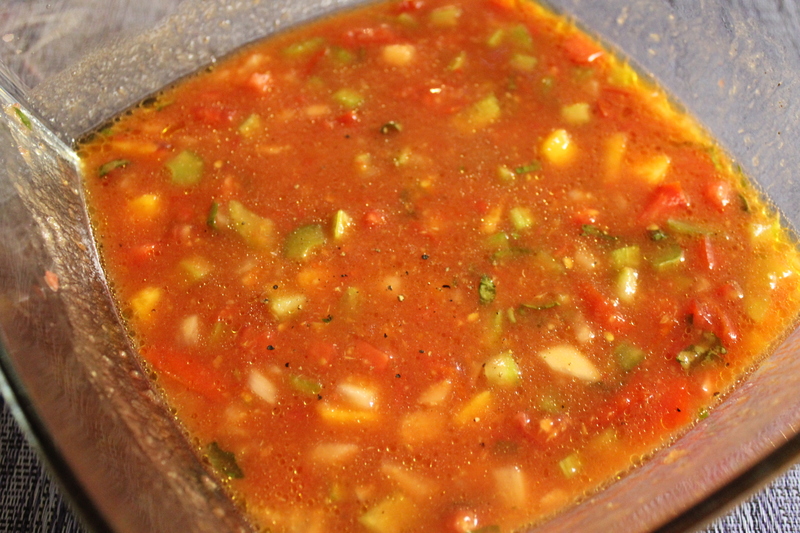 Add the vegetable juice, olive oil, vinegar, sugar, salt and pepper and stir until well blended. Chill several hours before serving. This is great by itself, or with some nice crusty bread or a tossed salad. This entry was posted in Food of the Month, Low fat, Vegetables/Vegetarian/Vegan and tagged chilled soup recipe, eat drink and be merry, Food of the month Kel's Cafe of All Things Food, kel's cafe of all things food, Kel's peachy keen gazpacho, peach gazpacho, peach recipe, peach tomato gazpacho, peach tomato soup, vegetarian recipes. Bookmark the permalink. I will MUST try this! Yes, Erda, you should. Let me know how you like it!